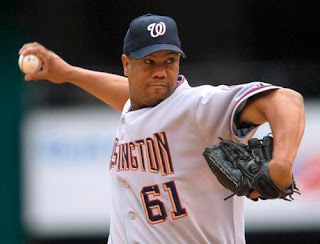 The has never been any player in uniform more larger in life than Livan Hernandez in the five years since baseball returned to the Nation's Capital. From 2005 through 2006, he was a fan favorite, an All-Star and the person who tossed the very first regular season pitch in team history in Washington, D.C. on April 14th, 2005. If performing baseball is a Broadway play--Livan Hernandez always acts on center stage. Many times his work is uplifting, sometimes comedic--with even some Greek tragedy thrown in. But no matter what play Livo performs on any night--he is always entertaining. 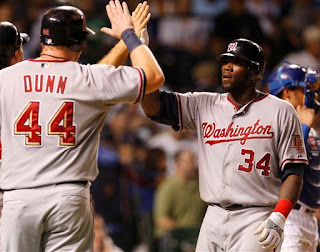 Which made last night's announcement that Ole' Number 61 will once again don a uniform for Our Washington Nationals beginning tonight overshadow Washington's biggest output of the season. A 15-6 romp over The Cubbies at Wrigley Field. Only Ole' Friend Livan Hernandez could do that. Collin Balester sent to AAA Syracuse to open up a Major League Roster Spot. "I told you so!!" stated The African Queen when I read her the good news from the team press release. "He's the mentor they need." She has been asking for Livan since the very moment she learned The New York Mets had released him. Like we've always discussed here, no one is more calm on the mound. No one seems less bothered by giving up a home run. Not one single player lets the pressure of any baseball game get to him less than Livan Hernandez. Nothing beats watching Livan chat in the on-deck circle with fans right in the middle of a game--joking, looking around, living in the moment--like he did so many times at RFK Stadium. He is a character and a professional toeing that rubber. "If I go to the mound in a pressure situation," former Nationals Pitching Coach Randy St.Claire once told The African Queen and I, "and put my hand on his heart, it will not be beating any harder than at any other point in the game. He doesn't let the moment get to him." Just the type of veteran presence Our Washington Nationals need and Team President Stan Kasten and GM Mike Rizzo talked about just the other day at Nationals Park during Blogger Day 2. Livan helps solidify a starting rotation that has been struggling these past few weeks. Youngsters pitching a demand of innings never reached before in their professional careers. A possible tipping point between getting experience and getting hurt. Not knowing how much Livan Hernandez has left in his tank, The African Queen and I are THRILLED he's back in Nation's Capital. When Livo played for The New York Mets this year--he certainly beat us handily. Unquestionably, he could help our burgeoning staff. 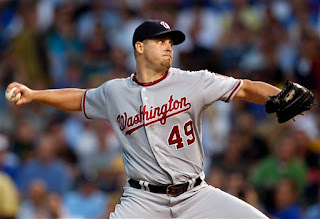 But more importantly, Ole' Number 61 will now have the opportunity lost back in 2006 when he was traded to The Arizona Diamondbacks for Garrett Mock & Matt Chico to fully realize how much Washington, D.C. appreciated his efforts during the very first years of the then infant versions of Our Washington Nationals. Ole' Friend Livan Hernandez is back. Time to break out our "61" jerseys for the very first game he pitches in the Red, White & Gold of Our Washington Nationals at Nationals Park. And you can bet we will be watching him closely tonight from Wrigley Field in Chicago. PS--As for last night's game. Wow!! 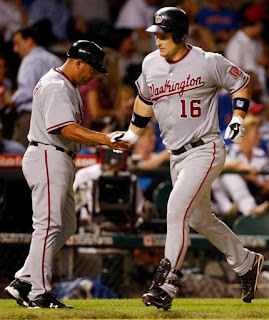 If Josh Willingham didn't display his value to Our Washington Nationals, I don't know if he ever will. Prodigious power, the consummate professional, Our Number 16 truly is a fine ballplayer that comes to the ballpark each and every day to compete. And makes it ever harder to believe Josh rode the pine earlier this season in our then crowded outfield situation. What a line score for Willingham last night--Four Official At-Bats, Five Runs Scored, 4 Hits (Two Home Runs), Six Runs Batted In and One Walk. 21 Home Runs and 56 RBI for the year. Now batting .301 for the season. Good numbers for playing 101 games, much of April & May as a pinch hitter only. Depth now coming to light when Elijah Dukes knocked in five runs last night including a scorcher of a Grand Slam off Aaron Heilman. Our Number 34 is the most talented player on our team. This year, he's been too aggressive at the plate, getting himself out by swinging at too many pitcher's pitches. But since his recall on August 1st, Elijah Dukes--despite hitting an average of .221--has driven in 21 runs. 21 runs!! How good would his month of August be if he was more patient and used that batting eye he definitely possess. Elijah Dukes has the tools. He just needs to develop his plate discipline. 14 hits, 15 runs protected Garrett Mock and gave him a necessary cushion to continue learning the craft of pitching in The Major Leagues. Mock was far from perfect, but at least on this night, he could experiment more with what might work for him in the future--without the worry of racking up another loss. 5.2 innings pitched, four runs allowed including a home run given up to Chicago Pitcher Carlos Zambrano. And finally, Charlie Slowes & Dave Jageler cracked us up listening to them on the radio last night. Having located Wil Nieves Batting Music Audio File played during each of his At-Bats at Nationals Park, The Boys Of Summer have now incorporated that Dancing Tune into the road game At-Bats of Nieves. Oddly enough, Our Number 23 was batting 1.000 when his music was played during the past few away games. Four for four after Wil Nieves singled home two runs in the top of the 7th last night. Remember--depending on the timing of the broadcast at any given moment--the batting music has not been aired for every one of Wil's Road At-Bats, and he recorded an out during each and every one of those plate appearances when the music was not aired. But, just when this Baseball Only Oddity was reaching a mystical level, Wil Nieves grounded into a double play in the top of the 9th last night directly following the airing of his Batting Music on WFED. You could hear it in their voices, Charlie & Dave were crushed, disappointed, stunned over the sudden ending. They didn't know what to say. They were onto something good and fun--an unlikely occurrence. Now gone, with one swing of the bat. Sadly. Trust in Fidel's Friend. All Familiar. The Team Store special offer for any game Livo pitches ought to be 20% off any merchandise you can heave onto the counter from the furthest reaches of the store. SenatorNat, in your wildest dreams did you ever think you would be seeing Livo pitch again here before the installation of the giant iconic baseball in center field? On Monday I told TAQ that I was 50/50 for Monday night's game in San Diego. I guess I will have to make an extra effort to get down there! Livo is one of my favorite players from '05 (along with Jamey Carroll) and it looks like he will be pitching. ABM - The Natstown sillouette, in the Round, atop Red Loft would give it a sort of Blazing Saddles town outside of the town effect - I imagine visitors to our fair city feeling that they were seeing the actual cityscapes on a pedastal as they root for their team to wipe the floor with the Nats. And now I want the reunion tour to begin: "Livo; Estaban; and John" (there is a song in here somewhere) - that Patterson jersey signed for $200 at the Dream Foundation booth must be gone by now, to be used by the actual Number 22 this September. As to the point about Livo as mentor, if he lasts past 6 innings in any game, he could have the youngsters come out to the mound prior to the seventh and show them what it feels like - pretty cool! And, Livo bobble-head night could be a set wearing the 2005 and 2009 visitor grays. He should race Teddy, too, on his pitching days, to give that smiling rascal a chance. Trust in a revolving door of Hernandezes with the Mets - all Natstownesque. "ABM - The Natstown sillouette, in the Round, atop Red Loft would give it a sort of Blazing Saddles town outside of the town effect - I imagine visitors to our fair city feeling that they were seeing the actual cityscapes on a pedastal as they root for their team to wipe the floor with the Nats." SenatorNat, I've not been to Philadelphia for a ballgame. As a Nats fan, do you think it would be safer for me to go to the ballpark in sight of the ersatz Liberty Bell there, or watch the game on TV in a bar down the street from the real Bell? From where would I be least likely to return home with my skull cracked? Similarly, when the Braves play in San Francisco, do they enjoy a home field advantage on account of the giant Coke bottle in the ballpark? Lucky, Good or Just Bad Luck? Why Does Metro Continue To Disappoint?